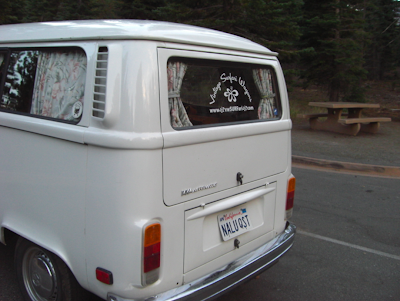 This past weekend up in Lassen Volcanic National Park, we ran into another bus from Vintage Surfari. 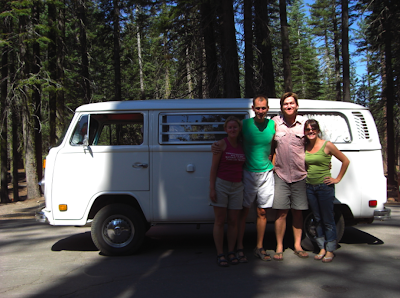 David and his girlfriend, Natalie, were over from Belguim spending a few weeks driving Nalu Imi, a 1978 Hard-Top Westfalia, around California. David is a bus-head, wanting to purchase one here in the states and bring it back to Belguim. He swung by our campfire later that night and we ended up talking quite late. Great people and future bus owners. They are headed to San Francisco this week, so if you see them around, say hello. EP talking shop with David. From L to R; Natalie, David, me, EP. Did you get some insight on Belgian beer? They make the best beer in Belgium! Have we got a connection for our Belgian trip now? Bill & Diane - you keep sending them out, we'll keep finding them. Might have something to do with the fact that my bus radar is in full effect now.